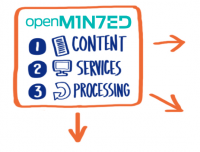 OpenMinted sets out to create an open, service-oriented e-Infrastructure for Text and Data Mining (TDM) of scientific and scholarly content. Researchers can collaboratively create, discover, share and re-use Knowledge from a wide range of text-based scientific related sources in a seamless way. Life Sciences Assisted curation of the EMBL-Chem and metabolomic databases and Neurolex ontology. Agriculture & Biodiversity Enrichment of agricultural databases to assist food & water borne disease outbreaks and product recalls. Social Sciences Automatic detection and linking of named entities, citations, intentions. Scholarly Communication Extraction of research entities for a map of academia, and topics for research analytics. OpenMinTeD will form 4 working groups to come up with an interoperability framework and guidelines to allow existing tools, resources and content to become an integral part of the infrastructure. Content metadata & transfer standards Document scientific literature, language resources, taxonomies, provenance. Service metadata & pipelining Document and classsiy text-mining services: how they receive input, in what form they output their results, how to combine for workflows, what granularity to consider. IPR & licensing Study IPR restrictions Describe license metadata for re-use, for content and TDM services & tools. How to apply for academic or non-commercial research. Registry Service Discover tools & services, scientific content, language resources. Workflow Service Mix and match text-mining services in workflows by using the best of breed of text mining components for some task. Annotation Service Get results in common representations and protocols, including quantitative indications of the quality of the automatic (or manual) processing.